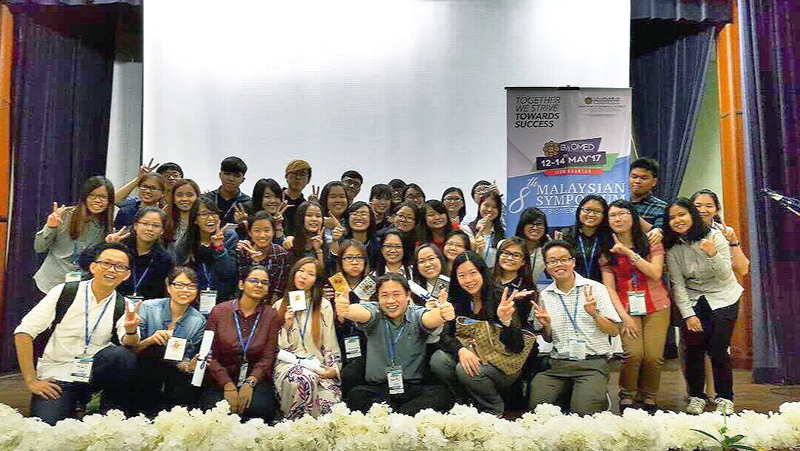 A group of students from the Department of Biomedical Science of UTAR Faculty of Science (FSc) brought cheers to the University when they won five awards in the 8th Malaysian Symposium of Biomedical Science which was held at the International Islamic University Malaysia (IIUM) in Kuantan, Pahang from 12 to 14 May 2017. Organised by the Department of Biomedical Science of IIUM Kuantan Campus, the symposium is an annual programme structured “by students for students” in the field of Biomedical Science. Themed ‘Together We Strive towards Success’, the IIUM-organised symposium aimed to provide a platform for students, especially undergraduates, to exchange and share their biomedical and health-related research activities through oral and poster presentations. It was also designed to engage in constructive dialogues related to research and career development, while simultaneously expanding their academic networks and fostering the importance of research and development as well as to seek potential research collaborations. UTAR’s contingent consisted of 37 students and three lecturers. Out of 37 participants, nine UTAR students were registered as presenters and competed with more than 170 participants from other participating universities, namely University of Malaya, Universiti Sains Malaysia, Universiti Kebangsaan Malaysia, Universiti Putra Malaysia, IIUM, International Medical University, Universiti Kuala Lumpur, Newcastle University, Management and Science University and Asia Metropolitan University. The oral and poster presentations were divided into four categories, namely ‘Community Health and Bioinformatics’, ‘Infectious Disease’, ‘Pharmaceutical’ and ‘Investigative Biology’. Amongst the five awards in the oral and poster presentation competitions, three students, namely Biomedical Science student Tan Ke En, Biotechnology student Jacqueline Wong Ka Ying and Biomedical Science student Lee Choi Ling were awarded the Best Oral Presenter. Adding to that success, the final year Biomedical Science student Tan was also awarded as the Overall Best Oral Presenter. Winning the Best Poster Presenter in the Molecular Biology, Biochemistry and Immunology was Heng Zeng Min.